These Build a Scene Dies from Crafters Companion can be used in so many ways from simple cards to advanced projects. 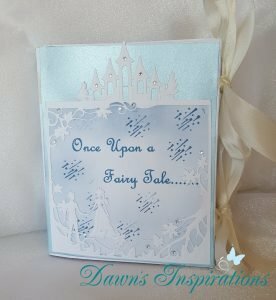 Here I have used the Happily Ever After Die set to create a Story Star Book. Just follow the video tutorial and you too can create your own! This is the most Spectacular card I have ever seen. Awesome tutorial. Will try this. Keep up the great work. Such a wonderful tutorial!!!!! Thank you so much for sharing it with us. your directions are so clear that I think I can do it! BRAVO!!!!! I just started playing with the build a scene dies and I’m totally in love! This project is fabulous and your tutorial is so easy to watch. I can see so many possibilities for special card/books. Thank you for sharing! Thank you so much for this tutorial, I love it! I can’t wait to make these for Mother’s day this year. I have a lot of cards to make so I’ll be starting on these very soon. 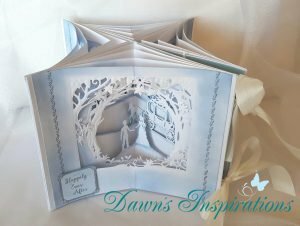 Hi Dawn I love all your inspirations and I have made this card for my friend’s wedding. I already had the build a scene die set from last year when it was launched so used that. I was just going to make the original build a scene card as per the die set but when I saw your take on it I thought whoopidy doo dah that is what I am going to make. All I am waiting for now is my Subscription box In March as that has the stamps to finish off each page.